Spending more on eating out than cooking at home is not just something you’re doing, or millennials are doing. It’s a trend among all Americans. In the late 1800s, Americans’ spending on food was 5% on food away from home and 95% on food at home (Source: USDA). As of 2013, now it’s split: 50-50. Americans spend as much eating out as they do cooking at home. I’m sure some people spend much more on food away from home than at home! So what? Obviously this inverse trend shows we are becoming lazy, and are relying more on having someone else cook our food for us. But as my best friend Megan shows, we have no need to be lazy or spend a lot on food – cooking is easy and affordable! I sat down with Megan and asked her how she became a cooking prep queen and what her secrets are. Riss: When did you first start doing your own meal prep? Megan: It was started when I went off to college. You’re cooking for yourself or eating in a dining hall and start to realize what you’re putting in each meal, what ingredients are fresh. This inspired me to think about the meals I can make at home. But for as long as I can remember, I’ve loved going to the grocery store with my mama, seeing and feeling what’s fresh. I check Food Network daily to see what the recipe of the day is, and checking their Healthy Recipes page. Riss: What is some of the best advice you’ve found for preparing affordable, healthy meals? Megan: Everything is about balance. When it comes to cooking meal prep, or fancy meal for your family, it’s portion control. No matter what the protein – seafood, meat, avocado, tofu – follow it up with a complex carb: quinoa, brown rice, sweet potato, couscous. Find something that’s a carb with a lot of nutrients. I supplement that with a roasted zucchini or roasted tomatoes to add some color and variety to the plate. These balance meals also make you feel fuller and less likely to snack on something unhealthy. A lovely pesto, tomato, mozzarella pasta made by Megan with some Purdue Chicken Cutlets for extra protein on the side. Riss: Following up on that, what is one of your favorite cooking books or online resources where you’ve learned some of these trick and tips? Megan: Giant Savory Magazine – you grab it at check-out and it’s free. They do a great job listing recipes with five ingredients, and just what’s in season each month. The most recent magazine’s theme was about summer BBQ. Riss: What is the best advice you can give others that you’ve learned yourself? Something only Megan can offer. Megan: Find something that isn’t impossible to make. You need to get yourself going and feel confident about your cooking capabilities. Start with something small (such as different pasta recipes) and then build on it. Usually I always thought it was all about the diet – that if you ate healthy, the gym didn’t matter. But now I know it’s a combination of the two. You don’t want to be so strict about what you eat that you don’t enjoy a good meal or a glass of wine once in a while. My mom and I take long walks or I go to the gym 4-5 days a week. I love group classes, and combine it with a healthy diet. You gotta listen to my chicken trick! Chicken is one of those hard things to sauté because you’re nervous you’re going to overcook or undercook it. At the grocery store, you can always buy a rotisserie chicken, it feeds 5-6 meals, and can use in many different recipes. Second trick is, you can go to the salad bar and get a pound of grilled chicken and they look like chicken strips. Both are $4.99! My most recent chick, Perdue has their chicken strips or cutlets in the poultry section under $2-3 on sale. You just throw them in the oven and are ready to eat. Riss: How much on average do you spend on groceries to prep meals for one week? Megan: Between $5-10 a meal. It depends on how many nights I’m cooking in or eating out. Riss: If you could submit a meal made by Megan to a food magazine, what would it be? Megan: That’s so hard to decide. Maybe my version of tacos. I take a spin on tacos inspired by Barefoot Contessa. Instead of using salmon, I use leftover steak, slice it up, put some fresh summer slaw (from Giant for $3.99/lb), little avocado, little pico de gallo, and a little salsa. It’s a summer steak taco made in under 15 minutes! It’s probably not coincidence that most of the healthiest people in your life always have a Nalgene or Camelbak in tow. Drinking water is an essential part of a healthy and balanced lifestyle. And although research proves that you do not have to drink the presumed 8 glasses of water a day, there are still many health benefits to drinking some water daily. Most of us drink water like a camel — we have a ton sometimes and then go stretches without any hydration. (By the way, a camel can consume 30 gallons of water in 13 minutes and then can go weeks without drinking). It’s very important for humans to not only stay hydrated, but drink water as a healthy habit. According to the Mayo Clinic, water makes up about 60 percent of our body’s weight. It also flushes out toxins in vital organs, carries nutrients to your cells, and provides a “moist environment” for ears, nose, and throat tissues. Most experts recommend drinking half your body weight in ounces of water each day. If you weigh 180 pounds, that’s 90 oz of water! How can you possibly drink that much water, especially if you prefer other beverages or aren’t used to drinking any water at all? Try fruit-infused water. There are several fresh ideas for making your daily water intake that much sweeter. From lemon and mint to cucumber and strawberry or watermelon and honeydew, there are endless permutations and combinations for the tastiest water for you. And whether your taste buds prefer citrus, berry, or herbs, there are many ways to reach your perfect fruit-infused water. Presenting some sliced fruits and herb springs in a mason jar is the aesthetic route, whereas a fruit infuser bottle is the best vehicle for fruity water on-the-go or during exercise. For a picnic or dinner party, a pitcher with a filter or cover can also be a great asset to your meal, keeping your party hydrated but also adding a natural element. Some college students crave Chick-Fil-A, Domino’s, or Insomnia Cookies. 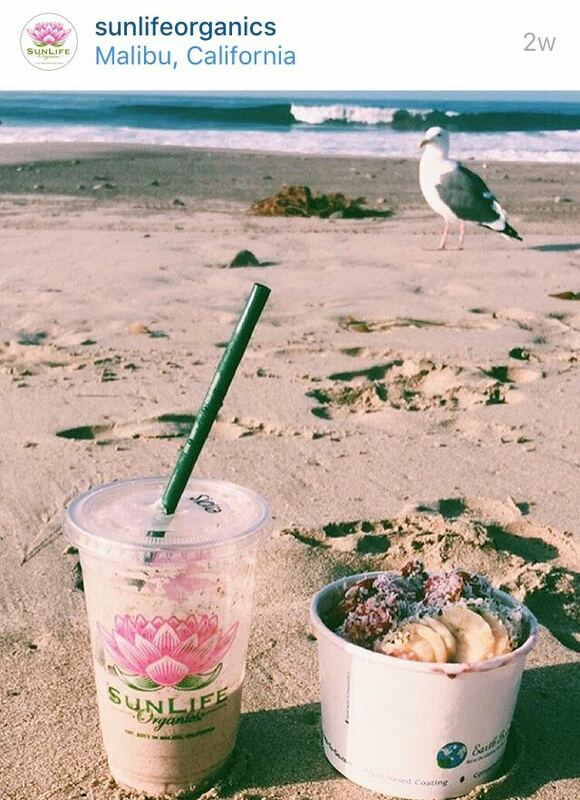 But when you go to Pepperdine University (and live in Malibu), you can’t help but crave SunLife. When I took my GRE Exam last week, I had one mission more important than remembering my identification or getting to the test center on time: stopping at SunLife beforehand to pick up a Wolverine signature shake, a smoothie one could equate to the nectar of the gods. SunLife Organics is the miraculous story of Khalil Rafati who used to battle addiction and unhealthy eating habits, and founded the organic juice bar to provide “top of the line organic produce, superfoods, supplements and more,” according to the website. Since it opened in Malibu in 2011, SunLife has sought to embody their mottos of “Love, Heal, and Inspire” and “Be Here Now.” “Every day, we aim to provide the best example we can for operating a business with the well being of people and the planet in mind,” owner Rafati writes. Four years later, SunLife now has four locations: Malibu West (at Point Dume), Calabasas, Thousand Oaks, and Malibu East (at Malibu Country Mart), the newest location. A photo from the SunLife Organics Instagram of a signature shake and an acai bowl. SunLife Organics is a unique corporation because they care about the health of their customers and the well-being of the nature around them; SunLife uses all organic ingredients from local producers in southern California. While I am obsessed with the Wolverine smoothie and will definitely try this recipe with my blender, I doubt this will replace the taste or experience of buying a SunLife Wolverine shake. As I have already been to SunLife three times in the past week, I know that the sirens of SunLife’s sweet ambrosia (aka the Wolverine) will call me back soon. P.S. Look out for another post about SunLife soon! I have contacted the company to find out more about their ingredients, suppliers, and recycling practices. Stay tuned! I scream, you scream, we all scream for ice cream. But much to the chagrin of the many elementary school children who follow the siren of the ice cream truck every summer, the environment screams too. The chemicals that keep your ice cream cold are the same ones that warm the atmosphere: hydrofluorocarbons, or HFCs. Greenpeace announced that companies like Good Humor, Ben & Jerry’s, Coca-Cola, and McDonald’s, have millions of beverage machines and ice cream freezers that use the chemical refrigerant. HFCs became ubiquitous in the 1990s to replace the controversial CFCs (chlorofluorocarbons) that were attributed to ozone-layer depletion in the 1980s. Unfortunately, HFCs have not been a problem-free replacement. “One ton of HFCs does as much atmospheric damage as 1,300 tons of carbon dioxide,” the Wall Street Journal reports. If you felt bad about eating ice cream because of the calorie and sugar intake, now you can justify passing on a scoop because it’s not guaranteed to be environmentally friendly. Heck, even your favorite ice cream from Haagen-Daazs or Baskin-Robbins could contain artificial hormones like rGBH. (Monsanto injected their cows with bovine growth hormone, something they genetically engineered in the early 2000s. They also provide milk for some of the nation’s top-selling ice cream brands). Mmmmm, can I have some artificial hormones with that scoop of cookie dough? Oh, and sprinkles on top. If you love our ozone, aren’t a fan of artificial hormones, choose a vegan diet, and maybe happen to be lactose-intolerant, than store-bought ice cream is not for you. Fortunately, there’s a very rissponsible alternative for a cold and sweet treat: homemade sorbet. It is a low-calorie, summery, and savory dessert that can be presented beautifully for dinner guests or dressed down for a night in with your Netflix. 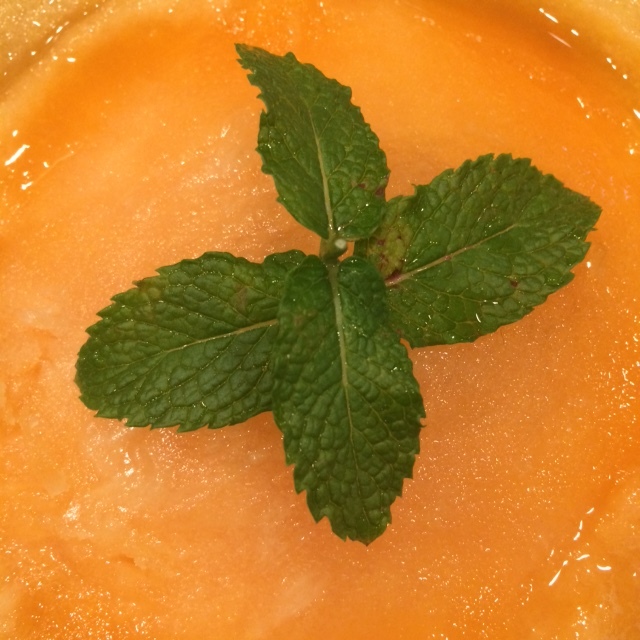 Watermelon and cantaloupe sorbets are my favorites to make during the summer, and this melon sorbet recipe comes from The Book of Ice Creams & Sorbets by Jacki Passmore (pg. 73). First, prepare the sugar syrup. Since the sorbet makes 6 servings, you only need 1/2 cup of the sugar syrup. In a large saucepan, bring about 2/3 cup of water and 1/2 lb of superfine sugar to a gentle boil. Reduce heat until bubbles break the surface, and then let it simmer for 10 minutes. Remove the pan from heat, and cool it in the refrigerator before using or storing. (When cooled, syrup can be refrigerated in a covered glass or plastic container for 2 to 3 weeks). 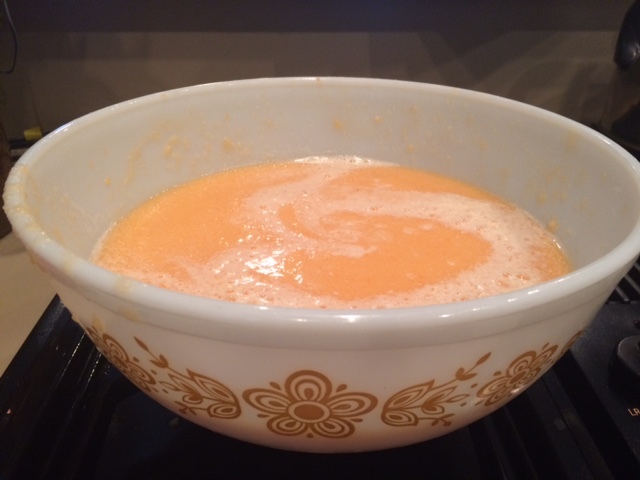 While waiting on the sugar syrup to cool, you can prep the cantaloupe. With 1 medium-ripe cantaloupe, halve and seed the melon. Proceed to remove the “melon flesh” inside, and scrape out as much fruit and juice as you can from the melon shell. I scrape the fruit from the melon rind into a mixing bowl. Once the sugar syrup has cooled, process the melon and sugar syrup together in a food processor/blender until the mixture is a smooth purée. I personally use a Cuisinart hand blender to process the melon and sugar syrup right in the mixing bowl — it’s much easier to use and less messy than a blender. Pour the blend into the ice cream canister. 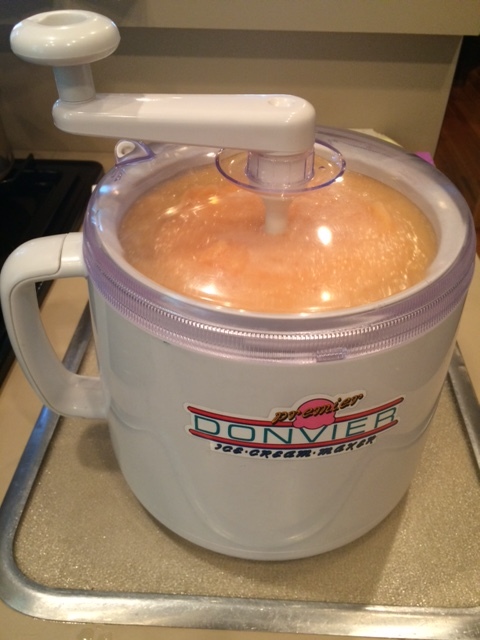 I personally have a Donvier ice cream maker, which works wonderfully. Freeze the mixture in the ice cream maker according to the manufacturer’s directions, until the sorbet holds shape. My ice cream maker manual requires you to turn the cylinder’s handle 2-3 times every 2-3 minutes for 15-20 minutes, until the handle is difficult to turn. Thus, it doesn’t take that long! When the sorbet is firm and can hold shape, transfer it to a freezer container. This is very important because too often I leave the sorbet in the canister and then it is like trying to chip at an iceberg. Place the sorbet in the freezer and wait until dessert! I add some fresh mint from my herb garden as a garnish, but feel free to be creative with how you present it. And voilà! Bon appétit. These above sayings and many other jokes and memes are everywhere on the internet, paying homage to the vegetable kale. The dark leafy green is irrefutably one of the world’s most popular super foods. Just one cup of raw kale is 33 calories, has nearly 3 grams of protein, 2.5 grams of fiber, vitamins A and C, folate, and omegas. Kale is used in countless recipes and cooked in many forms, but a tasty and simple recipe is kale chips. A great summer resolution is to start substituting potato chips with kale chips. Potato chips may be your guilty pleasure, but the commonly known fact is that they aren’t good for you (or your beach bod). Studies have shown that consuming potato chips on a daily basis can cause a gain of about 1.7 pounds per year. Other starchy potato products cause an annual weight gain of about 1.3 pounds. Not only are potato products not beneficial to your personal health, but they also have a higher carbon footprint than other foods. Potatoes are ranked ninth of all food groups in the amount of greenhouse gas emissions they produce; the potato is the non-protein with the highest carbon footprint. While vegetables, such as kale, are only ranked thirteenth, the difference in kilos of carbon dioxide between potatoes and vegetables can add up. Here is our personal recipe for making your own kale chips at home. Did I mention that packaged kale chips at Trader Joe’s cost a hefty $4.00 a bag? Definitely an incentive to make them yourself! Use nonstick tinfoil on a flat pan, or PAM cooking spray on some aluminum foil. If you bought the kale packaged and pre-cut, pre-washed, it is ready to go on the pan! Spread out the kale so that the pieces cover the entire foil area. If you purchased a head of kale, make sure to wash it thoroughly and then cut it into bite-size pieces before placing it on the pan. Optional: to add seasoning, sprinkle the kale with some spray butter, salt, and pepper. This is highly recommended to add some flavor, and you can control the amount of seasoning you are adding if you are counting calories or cautious of certain ingredients. Heat the pan in your oven on BAKE at about 400 degrees Fahrenheit. The kale should bake for about 10 minutes, or until it’s reached your desired crisp.